Or maybe folk, like avant-garde folk, sort of like experimental art music, sometimes it sounds like rock, often times you can dance to it, the vocals almost always remind me of The Beach Boys, the song structures and the lyrics, however, do not. It is a “collective” (not a band, really), because they are not always ALL together. They like to have other projects, creative outlets, the freedom to play and experiment without one another, and the freedom to come and go as they please. Over the past decade, the collective, in whole or in part, including solo stuff, has released over 13 albums. Sometimes they wear masks and pretend they are animals, or other things. Each is from Maryland (Merriweather Post Pavilion – the album name, see above – is also a famed music venue located in the woods between Baltimore and DC – I think Hendrix and Janis Joplin played there once). Each knew the other as kids, transplanted separately to NYC and formed the collective in 2000-ish in a loft on Prince Street (a few blocks from my place, b/t/w). Not ALL live in New York any more, only 2. Each is now in their 30’s. The collective is a deep part and a major influencer of a very vibrant, US-based alternative (rock/folk) music scene, much of which is housed in NYC, and Brooklyn in particular (primary neighborhoods: Williamsburg, Ft. Greene, Red Hook, D.U.M.B.O.). This scene features tons of bands/collectives, many growing in popularity, slow and steady. If you are young and you are NOT into hip-hop, classic rock or American Idol-esque pop, this might be your scene. You also might be a hipster. It is often hard to tell what instruments the collective plays. I know there are bass and drum sounds. My friend Jason thinks they play computers. I think they do, sometimes, sometimes I know I hear guitars though. To me, their signature sound is in the vocals, they are gorgeous, and most of the time they are not computers. 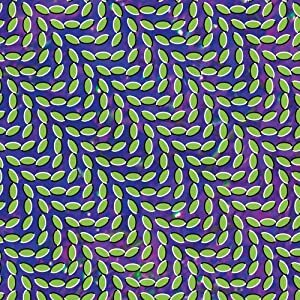 Up and to the release of Merriweather it was a challenge for me to recommend the collective. Its greatness was not obvious, and for some it still may not be obvious, in the same way Kid A can baffle even the most sincere music fan. Nonetheless, I think it’s time. It’s music for the patient, the hungry, the anti-pop, those with ears craving something new. It’s also damn catchy and beautiful. The lyrical themes of Merriweather center around love, loss and family, which I don’t think is weird at all, and doesn’t feel very hipster, does it? Here’s my introduction to the band and the record, a tune called My Girls.